There are, I’m pretty sure, like three Mets fans left who blame Carlos Beltran for signing a massive contract or for not swinging at Adam Wainwright’s curveball in 2006 or for neglecting the advice of the Mets’ crack medical staff before the 2010 season or for destroying the team’s clubhouse chemistry with his “expected & than” return later that year. Those people are silly, and because silly people can sometimes be exuberant with their silliness and revel in the attention it brings them, they’re loud with their opinions on Twitter, in comments sections and probably on WFAN if you’ve got the stomach for listening. By now, after Carlos Beltran left Flushing as one of the Mets’ five best position players of all time and gave the team a prized pitching prospect as a parting gift, the haters and blamers get drowned out and shouted down pretty quickly. But then everyone — myself included — harps on their continued existence, as if there aren’t three people in India who think Gandhi totally sucked and three at Microsoft who think Bill Gates was a moron, and so on. Carlos Beltran sat in the Cardinals’ dugout before Friday night’s game and answered questions from members of the New York and St. Louis media for about 20 minutes. He talked about his time with the Mets, the disappointing finishes of 2006 and 2007, his friends on the team (“I love him,” he said of Johan Santana), his appreciation for Terry Collins, his arrival in St. Louis, everything. And he talked a lot about Mets fans, mostly because he was asked a lot about Mets fans. When asked why they never embraced him, he suggested it’s because he isn’t very emotional on the field and never wanted to betray himself by acting like something he is not. Stuff you know about, really. And he kept saying, “that’s their choice,” because probably — and hopefully — Carlos Beltran knows enough about baseball to realize that Carlos Beltran is awesome at baseball no matter what anyone says. 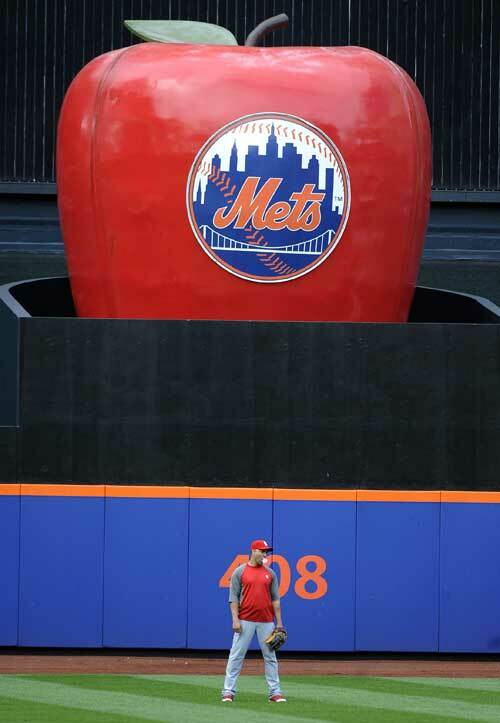 The Mets showed a short pre-game video tribute to Beltran. It featured lots of highlights of Carlos Beltran playing baseball, so it was unutterably awesome. Then everyone (in my earshot, at least) who was at the game, paying attention and moved enough to respond in some way cheered the man. Some reported hearing boos. I heard none. I moved out from the press box to Section 327 of the Excelsior level* before Beltran’s first at-bat. When Beltran was introduced, one guy I could hear booed him loudly and persistently. One guy. Everyone else in the area clapped, some standing as they did. It was a much, much warmer reception than the one Jose Reyes received a month earlier. Again: When you — we — defend Beltran against his remaining Mets-fan haters, we are likely giving way too much credence to a handful of loud fools and an army of strawmen. And Beltran’s best defense is his great offense, to borrow a football phrase. Every time he steps on a baseball field, Beltran makes the blamers look dumber. We can spare them our energy now. Carlos Beltran’s got this. *- Can someone please make t-shirts that say “I’m calling it Loge”?